Entry to the event is free to all resident pass holders, and under 13s go free. 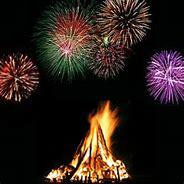 The bonfire starts about 6:30pm with the fireworks following at about 6:45pm (this may change slightly depending on the rally finish time). Please note that no dogs or other pets are permitted entry to the venue, as part of circuit licensing requirements. We do hope you may join us for this end of season finale, and look forward to seeing you. Whilst Oulton Park has instructed the specialist firework contractor to emphasis colour over noise, please can all horse and pet owners be aware that the 10 minute display will still be quite audible in the local area.